Skimming an article on biomimicry in the NY Times today revealed the usual eye-candy approach to the subject. Beautiful structures inspired by natural forms with claims to greatness, but little more. Two parts of the article, though, are worth noting. Located near the end, it would be easy to overlook these passages. 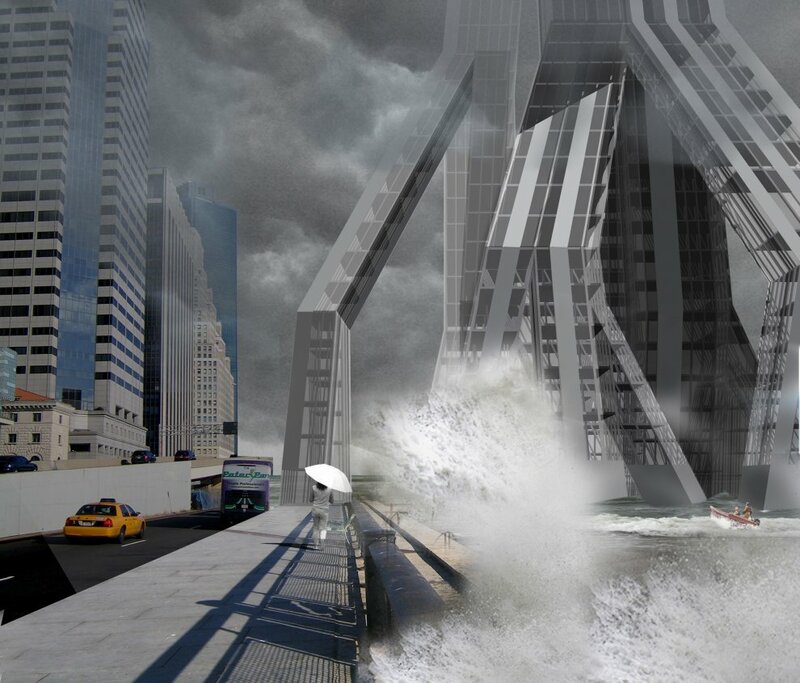 The first references Skygrove (image below), the highrise concept that won first place in MOMA’s Rising Currents competition. Daniel Williams, a practicing architect in Seattle who specializes in sustainable waterfront design, noted that Hurricanes Andrew and Katrina obliterated nearby mangrove forests in Florida. The trees’ adaptive strategies, like their tendency to clump together and utilize all of the land around them, could be more worthy of emulation than the shape of their roots, he suggsted (sic). “We should look at the ecology and botany and how the tree is functioning, rather than just copying its form,” [emphasis added] Mr. Williams said. When it comes to functioning optimally despite extreme weather, the octopus could be the ultimate model. Rafe Sagarin, a marine ecologist and the author of “Learning from the Octopus,” said a physical readiness to adapt, combined with a thoughtful approach to sudden change, gives the cephalopod its edge. The octopus’ combination of quick and measured thinking could inform coastal cities’ approach to climate change, he said. While government must respond quickly in emergency weather situations, people on the ground can provide the other half of the octopus approach: carefully considered, long-term solutions. It is not clear if Sarah Amandolare, the author, meant to be funny, but concluding that the best biomimicry might come from modeling ourselves after another animal with a big brain is just that. Her words are a call for crowd-sourcing really, capitalizing on the multitude of ideas that could come from an informed citizenry, and coupling that with good urban planning. In other words, the more people who are invested in creating to solutions to climate change, the better. But first, the public needs access to detailed information and hazard maps depicting sea-level rise. A functional federal government would help too! Hurricane Sandy dealt a major blow to the New York City metro area. The website, Manhattan Past, notes the historic landscape pattern inherent in the city’s modern day evacuation routes. Landscape memory, recording the history of the landfill that created the Manhattan of today. Yesterday’s newfound real estate, today’s and tomorrow’s flood inundation zone, thanks to climate change. Another key map comes from the Angela Fritz’s WunderBlog on the Weather Underground site. Record warm Atlantic waters fueled Sandy.